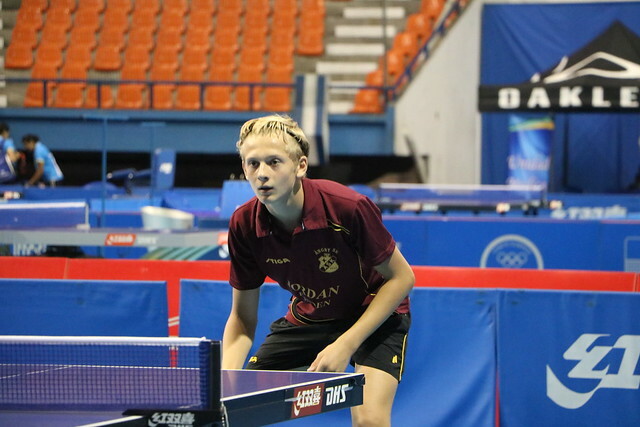 Major contenders for honours, the top five seeds, all players with current world rankings, emerged successful in their initial group stage Junior Boys’ Singles contests at the 2017 El Salvador Junior and Cadet on Friday 18th October. It was first place in the group without surrendering a single individual game for Sweden’s Oskar Danielsson, India’s Mudit Dani and Panama’s Jacobo Vahnish, as it was for the host nation’s Oliver Mendoza. However, for Oscar Villalta, the no.5 seed, securing first place was a more testing experience. After beating Puerto Rico’s Daniel Hernandez in three straight games (11-8, 11-5, 14-12), he needed the full five to overcome Costa Rica’s Alfredo Sanchez, only succeeding by the very minimal margin in the decider (12-10, 11-6, 9-11, 4-11, 12-10). A brave effort by Alfredo Sanchez but alas for the Costa Rican there was to be no place in the main draw; on his next visit to the table he was beaten by Daniel Hernandez (11-6, 11-9, 11-6). Thus the Puerto Rican secured second place and a passport to the main draw; players finishing in first and second places in each of 15 groups advanced to the second phase. Disappointment for Costa Rica and there were three further five games defeats for the Central American country but with a degree of consolation. The end result was second place in the group behind opposition that remained unbeaten to secure pole position. Close defeats for Costa Rica but there was the reverse side of the coin. John Lopez recovered from a two games to one deficit to beat Panama’s Emilo Wong (12-10, 8-11, 8-11, 11-6, 11-6). Notable performances but alongside the top four names, four more names caught the eye; Puerto Rico’s Jabdiel Torres in addition the Mexican trio of Layan Neumann, Adrian Castillo and Alberto Lopez all topped their groups without surrendering a single game. Impressive performances; it was the same from El Salvador’s Diego Orantes and Sweden’s Oskar Hedlund, first place was secured without a fifth and deciding game being required. The first two rounds and quarter-finals of the Junior Boys’ Singles event will be played on Saturday 19th August; the semi-finals and final on Sunday 20th August.